Pardo, D.E. ; Rozo, L.; Alenyà, G.; Torras, C.
This work presents a probabilistic model for learning robot tasks from human demonstrations using kinesthetic teaching. The difference with respect to previous works is that a complete state of the robot is used to obtain a consistent representation of the dynamics of the task. The learning framework is based on hidden Markov models and Gaussian mixture regression, used for coding and reproducing the skills. Benefits of the proposed approach are shown in the execution of a simple self-crossing trajectory by a 7-DoF manipulator. Pardo, D.E. [et al.]. 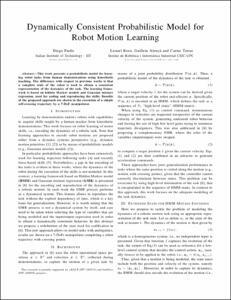 Dynamically consistent probabilistic model for robot motion learning. A: Workshop on Learning and Interaction in Haptic Robots. "Proceedings of the IROS'2012 Workshop on Learning and Interaction in Haptic Robots". Algarve: 2012, p. 1-2.